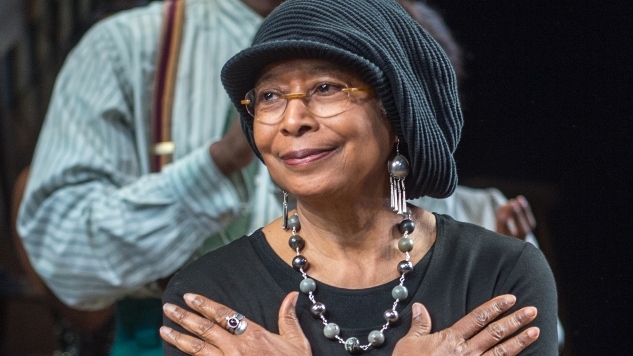 This past week, Pulitzer Prize-winning author Alice Walker endorsed a book that has repeatedly been called anti-Semitic. During a Q&A with The New York Times Book Review, the The Color Purple author expressed her admiration for one of the notorious British conspiracy theorist David Icke’s most controversial books. The book was so obviously problematic that Icke’s publisher Gateway refused to print it, and Icke had to publish it himself. A former football player and sports broadcaster, Icke has fallen out of the public’s good graces since announcing that he is the “Son of the Godhead” and embracing a theory about an interdimensional race of reptilian beings that have hijacked Earth. If you really want to discredit someone, you arrange for anti-Jewish or anti-whatever events such as the smashing of graves, assaults on people, even a terrorist bomb in the extreme. You then point the finger at your target person or group. You say they are either directly responsible or ‘incited’ the actions by what they are writing and saying. I strongly believe that a small Jewish clique which has contempt for the mass of Jewish people worked with non-Jews to create the First World War, the Russian Revolution, and the Second World War … They then dominated the Versailles Peace Conference and created the circumstances which made the Second World War inevitable. They financed Hitler to power in 1933 and made the funds available for his rearmament. Why do we play a part in suppressing alternative information to the official line of the Second World War? How is it right that while this fierce suppression goes on, free copies of the Spielberg film, Schindler’s List, are given to schools to indoctrinate children with the unchallenged version of events? And why do we, who say we oppose tyranny and demand freedom of speech, allow people to go to prison and be vilified, and magazines to be closed down on the spot, for suggesting another version of history? At the end of this passage, Icke references the vilification of Holocaust deniers (think: David Irving in Denial, based on a true story) and the shutting down of the Japanese magazine Marco Polo in 1995 after it published articles that questioned the existence of concentration camps, losing advertisers as a result. Several have taken to criticizing the New York Times Book Review for running the piece or at least failing to include a disclaimer, to which the publication has responded. By the Book is meant to clue readers into the lives of major writers through “the lens of books,” not reflect opinions of The New York Times. None of these pieces have ever included commentary from the NYT staff. To shift the focus onto the NYT is to hold someone else responsible for Walker’s own controversial beliefs and overlook her accountability.